Jeffrey Dean Morgan is extremely happy that he was able to take part in the 300th episode of Supernatural. The actor, along with the rest of the cast recently sat down to discuss Morgan's return and reaching the 300 episode milestone. One thing that is clear right from the start, is the fact that the cast legitimately comes across as a family who have a good time making the show and interacting with their rabid fan base. 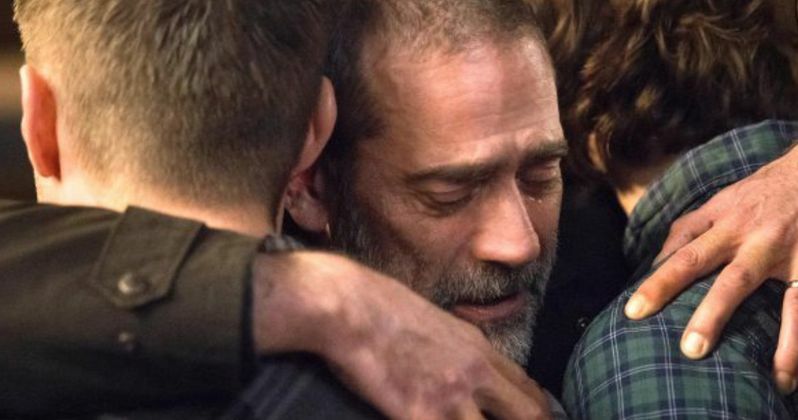 The return of Jeffrey Dean Morgan to Supernatural is an emotional reunion. The actor hasn't been on the show as John Winchester in a decade, and fans have asked about his return a lot since then, even though his character was killed off. Morgan was more than happy to return. As it turns out, the cast weren't the only ones who Morgan was excited to see. His reunion with Winchester's 1967 Impala, Baby, was also a pretty big deal. He says, "I was like, 'oh god, I get to get in the Impala!" As for his return, Morgan had this to say. "Every time a fan asked, I always said the same thing: I'm totally open to returning. It's about the story. Because I'm very good friends with Jensen (Ackles) and Jared (Padalecki), and we've talked about it and it was always, Before the show goes off the air, I hope to get on. Jensen called and said, Hey would you be interested in doing our 300th? I wasn't going to be working at this time so absolutely, sure." When it comes down to it, Jeffrey Dean Morgan is back as John Winchester for closure. Supernatural left things open between John Winchester and his sons, which was always an emotional stumbling block for the Winchester Brothers. With that being said, it seems that they have finally accomplished that goal, and there isn't going to be very many dry eyes while watching the reunion. As for returning and getting back into character, Morgan says that wasn't a challenge. He explains. "To step into it again, it's like wearing an old pair of boots. I'm friends with these guys so it's a joy to come in. Today was my first day and you just kind of sit down and do it. It's fun and it's easy. I remember very well what I did then. I remember the story and I remember playing with these guys. If I hadn't been seeing and talking to these guys the last 10 years maybe it would've been a little bit more of a nervous situation, but I've been doing this a long time. I feel like I've been doing it forever and I really haven't stopped working since I was last on this set. Like a father would be, I'm very proud of the guys." 300 episodes is an extremely rare feat and that is not something that is lost on the cast and crew of Supernatural. When asked about the longevity of the show, Jeffrey Dean Morgan attributed it to the work ethics of Jensen Ackles and Jared Padalecki, noting that "They show up every day, they're not grumpy, they know their sh*t, they're pros." Morgan knows how hard it is to be away from family to work, so he has nothing but respect for the cast and crew. He continued by saying. "Because of that, these crew members that could have gone on to do whatever they want, they stay here for those two guys. They've got two great leads that set an example for everyone else and it's how it should be done. They're just good guys and I love 'em. That's the simple answer: It's because of those two. There's a couple more (people) that have been here just as long and they're also equally as great but it really starts with number one and two on the call sheet. They set an example for cast and crew." Supernatural airs its special 300th episode on Thursday, February 7th at 8 PM. In addition to the interview with Jeffrey Dean Morgan, the cast got together for a pretty massive photoshoot that features some fun behind-the-scenes along with some teases of what fans will get to see in a few weeks. It's going to be an emotional reunion, so consider yourselves warned. But, there will more than likely be a lot of love to balance it all out. You can check out the interview with Morgan and the rest of the cast below, along with the pictures from the set, provided by the Entertainment Weekly Twitter account.